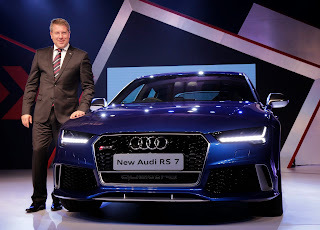 Mumbai, May 11, 2015: Audi, the German luxury car manufacturer, today introduced the latest version of its popular sporty spearhead – the new Audi RS 7 Sportback in India. With aesthetic design and impressive sportiness, the new Audi RS 7 Sportback fascinates at first sight. Priced at INR 14,020,750/- (ex-showroom Mumbai and Delhi), the powerful new Audi RS 7 Sportback was unveiled by Mr. Joe King, Head, Audi India and is available at all Audi dealerships across India. “Embodying our philosophy of “Vorsprung durch Technik”, the Audi RS 7 Sportback is Audi’s superlative illustration of sportiness, progressiveness and sophistication - combining the practicality of a large, five-door Sportback with strengths and fun of a sportscar. The combination of a powerful four‑liter V8 engine with cylinder on demand technology, quattro drive and intelligent lightweight design makes the Audi RS 7 Sportback an outstanding piece of sports equipment for our discerning customers in India, who desire a dynamic, yet efficient driving experience. 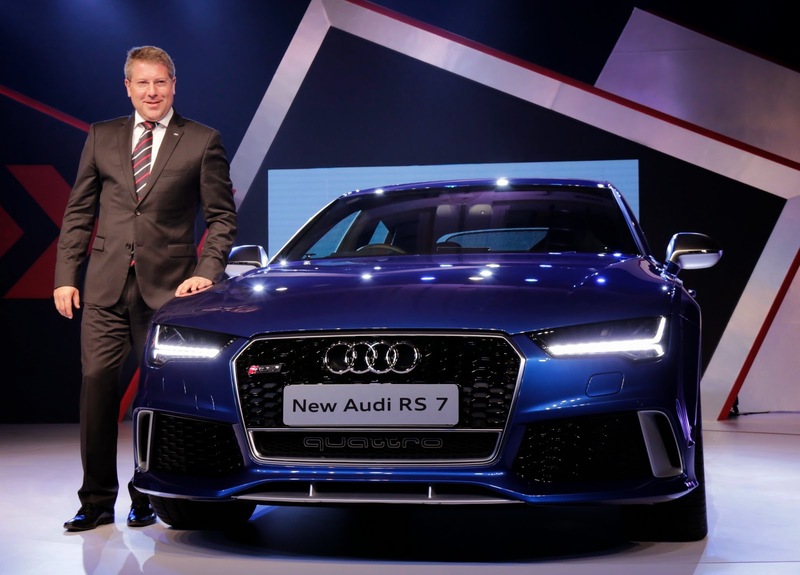 This beautifully superior car has delighted many customers since its launch last year and we are confident that the new Audi RS 7 Sportback will further entrench our brand as the leader in the luxury sportscar segment in India,” said Mr. Joe King, Head, Audi India. For the first time, Audi has introduced the Audi Matrix LED headlamps on the new Audi RS 7 Sportback. The LED headlamp cluster dynamically alters the high beam on a real time basis with the sole aim of not dazzling the oncoming traffic and the vehicle(s) in the front. The dynamic Sportback also includes integrated dynamic turn signals on the front and the rear, as well as new tail lights design. The new Audi RS 7 Sportback also sets new standards with its hybrid aluminum design, making it weigh roughly 15 percent less than a comparable all-steel body, thanks to Audi’s lightweight construction technology. The quattro® permanent all-wheel drive system gives the powerful five-door Sportback a decisive advantage in traction and driving safety. The twin-turbo V8 4.0 TFSI® engine displaces 3,993 cc and produces 412 kW (560 hp) between 5,700 and 6,600 rpm, with a constant 700 Nm of torque available from 1,750 to 5,500 rpm. Despite the supreme power of the Bi-Turbo V8, the Audi RS 7 Sportback consumes on average just 9.8 liters of fuel per 100 kilometers, thanks to its efficient Cylinder on Demand technology (COD). Audi Cylinder on Demand technology unites dynamic performance characteristics with low fuel consumption and emissions. By deactivating four cylinders in part load operation, the new Audi RS 7 Sportback achieves comparatively low fuel consumption and low CO2 emissions without compromising on the superb performance potential. The new Audi RS 7 Sportback sports a superior design with striking edginess. Specific details on the exterior of the five-door coupé set sporty accents. The long engine hood, the sporty and flowing C‑pillars and the sharply sloping rear end form an aesthetic overall impression. Slight modifications have been made to the bumper, with its distinctive air inlets. The Singleframe grille with the black honeycomb, typical of the RS models, now sports even sharper and more distinctive corners. The headlights are also adapted to the new Singleframe grille. Three optional packages – matt aluminum, gloss black and carbon – make the look of the new Audi RS 7 Sportback even more distinctive. The central front air inlet bears the quattro® lettering. Modifications have also been made to the bumper, with its distinctive air inlets. The elegant dynamics of the exterior design carry over to the interior of the new Audi RS 7 Sportback as well. The salient element is the “wrap-around” – an arched, horizontal line below the windshield. The cockpit is tailored for the driver, with the center console oriented in the driver's direction. In the elegant black interior, dominated by the RS sport seats, the designers have revised the instrument cluster: the air outlet controls of the vent nozzles, the shift paddles behind the steering wheel and the quattro® emblem on the instrument panel. The standard MMI® navigation plus with MMI® touch now uses the modular infotainment platform of the latest generation; its highlight is an efficient graphics processor from Audi’s partner, Nvidia. “The new Audi RS 7 Sportback reinstates the reputation of the RS models as the superior, top athletes of our brand. With the new Audi RS 7 Sportback launch on the heels of the limited edition Audi R8 LMX and the all-new Audi TT Coupé, we are confident of strengthening our leadership and accelerating our growth in this segment. We are ready with a few more surprises for Audi fans and will be launching some more fantastic products this year soon,” added Mr. King. The Audi model range in India includes the Audi A3 Sedan, Audi A3 Cabriolet, Audi A4, Audi A6, Audi A7 Sportback, Audi A8 L, Audi Q3, Audi Q5, Audi Q7, Audi S4, Audi S6, Audi RS 5 Coupé, new Audi RS 7 Sportback, all-new Audi TT Coupé, Audi R8, Audi R8 Spyder, Audi R8 V10 plus and Audi R8 LMX.